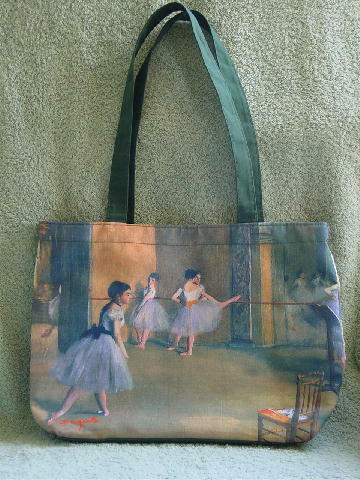 This fabric (100% polyester) purse has a ballet scene by Degas. The bottom, top, and 22" long handles are in a medium green. The interior has a plastic/synthetic green lining. It's in various shades of green, light violet, orange, white, black, brown, tangelo, maize, and various shades of blue. It has the same scene on both sides.